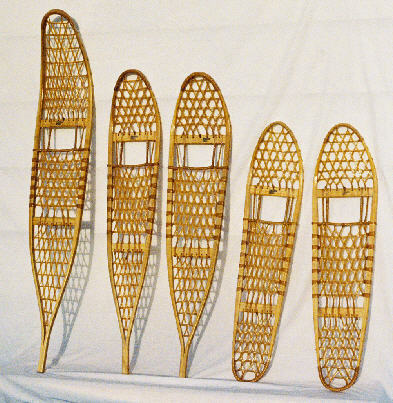 Designed by experienced northwoods outdoorsman Gus Gustafson and crafted by master dogsled builder Clyde Risdon. These beautiful traditional shoes are crafted in the old fashioned way - one at a time. We have combined the look of traditional wood and rawhide shoes with our new poly-lace webbing. Poly-lace looks like rawhide but is much stronger with less maintenance and lighter weight. We offer them in four sizes -- 10in. x 56in. Alaskan 260lb. cap. - 9in. x 46in. Alaskan (designed for smaller framed people) 200lb. cap. - 10in. x 46in. Trail 220lb. cap. - 10in. x 36in. Modified 200lb. cap. 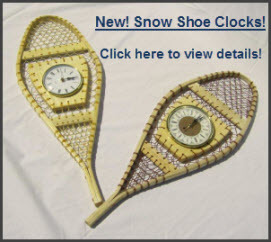 Save the date for snowshoe Classes this winter! For more information you can call us or Sleepy Hollow State Park. Kits come with sanded frames, all lashing locations marked, easy to follow instructions, and all materials (our bindings & tools) except scissors, lighter, and varnish. You can order any sizes listed at this web-site except the Ojibway.